Ecomsiam Review 2019: Is Ecomsiam a Good Hosting? Established in 2000, Ecomsiam is a web hosting provider based in Thailand. Its hosting-related solutions include domain name registration, VPS hosting, reseller hosting, and email hosting solutions, among others. Ecomsiam is a Thailand-based web hosting provider founded in 2000. The company offers an array of hosting solutions including shared web hosting, reseller hosting, VPS hosting, dedicated servers, email hosting, CMS hosting solutions, and domain name registration services. The Ecomsiam website is available in Thai and English. Ecomsiam has a special CMS hosting solution that comes in two packages: Drupal hosting and Joomla hosting. Other unique hosting solutions from this vendor include shopping cart hosting, blog web hosting, and forum hosting. Ecomsiam’s most basic hosting solution is its Lite hosting. Based on the package you choose under this solution, you can get anywhere between 2GB and 8GB disk space, 10 and 100 email addresses, and 30GB and 200GB bandwidth. This vendor’s VPS solution has several packages including the starter package VPS-Standard30 (1 Core CPU, 2GB RAM, 30 GB disk space, and 30GB backup storage space) and the premium package VPS-Advance60 (2 Core CPU, 4GB RAM, 60GB disk space, and 60GB backup storage space). The company’s servers run on CentOS Linux operating system. Ecomsiam performs automatic daily and weekly backups of its servers. From the easy to use cPanel control panel, users can view and easily restore their website backup data. 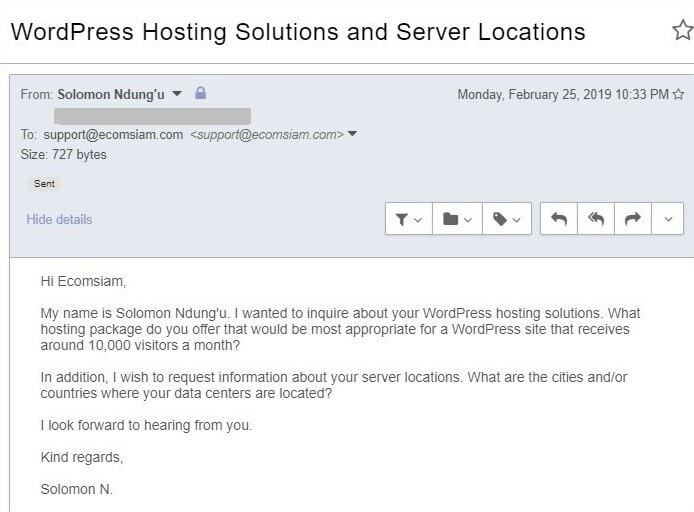 Ecomsiam’s hosting solutions are a bit expensive even though they include a noteworthy number of features. The vendor’s billing cycles are pretty inflexible, requiring customers to commit to a contract that lasts at least 12 months. 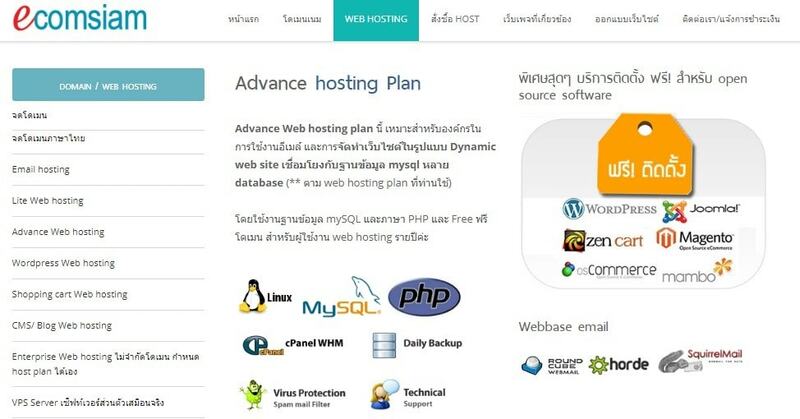 The prices of its hosting plans are listed on its website in Thailand baht. The company offers a 30-day money-back guarantee and an uptime network guarantee of 99.9%. You can contact Ecomsiam’s customer desk via telephone, email, or live chat. The hosting provider doesn’t have a ticketing system. The vendor’s technical support team is supposedly available 24/7, though they did not reply to the email I sent them. Though Ecomsiam does not have a knowledge base, it has tutorials, articles, and a detailed FAQ section on its website. Whether you have a small website or a large website for a big corporation in Thailand, Ecomsiam has what it takes to deliver excellent hosting solutions. Given that it has no data centers outside Thailand, the vendor might not be very ideal for businesses outside Thailand. Its unresponsive support is also a factor that would-be customers should consider when making their decision. Wondering how Ecomsiam stacks up against other Web Hosting companies? Enter any other Web Hosting company and we will give you a side-by-side comparison.